The Air Intake Louver is made of Fibreglass Reinforced Polyester(FRP) . As the louvers are made of FRP, the life span is much longer. Also with the unique one piece design, removal for cleaning is made easier. The Casing & Basin are made of Fibreglass Reinforced Polyester (FRP). This obviates the need for painting and thus reduces the maintenance cost. Filler is vacuum-formed of 0.4mm thick PVC film with excellent chemical and distortion resistance, and is suitable for operation with inlet water temperature up to 55 o C . Its compact package design is easy to take out for cleaning. The special configuration of the filler incorporates function of drift eliminator, louver and wet-deck surface. 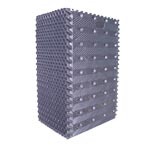 The honeycomb shaped louver contributes minimum resistance to airflow and prevent ingress of foreign matters. The drift eliminator feature prevents water droplets from escaping in the exhaust air stream so as to ensure drift loss to be less than 0.001% of circulating water flow rate. The wet-deck surface is specially designed to provide maximum air/water contact and low air pressure drop to ensure high efficient heat transfer. Distribution System is specially designed. It distributes water evenly over the entire top of in-fill,to ensure maximum performance. All supporting steel members are hot-dip galvanized to minimize rusting and corrosion and ensure long service life even in corrosive atmosphere. The stainless steel hardware members are also available upon request. 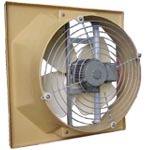 All Fan blades are of the adjustable pitch type and are manufactured from polycarbonate material. Each fan is pre-set and balanced in factory. All Fan motors are TEFC Flange type with cast iron casing and stainless steel shaft.